Behold, the very last thing you'd ever want to see while driving down a dark, winding, and lonely road in the middle of the night! Seriously, imagine your headlights catching that. That's why we're proud to present this exclusive and creepy costume. Because for far too long, people have made light of ghosts. Between that "Casper" guy and all those people who go out wearing white sheets with eyeholes cut into them, the spirits of the undead have taken quite a beating. We still think they're downright terrifying, and we know that this plus spooky ghost costume will prove us right! The best part of this costume is that it's deceptively simple. No makeup necessary, no fancy special effects. Just a pair of dark gloves and the robe, which has a layer of fringed white flowing over the top for that disturbingly ethereal, ancient and rotting look. Attached is the the foam head with a black mask, which will have your friends and fellow Halloween partiers feeling unsettled when they look at your face... and see only a dark abyss of nothingness. It's a great way to add an air of chilling mystery to your getup this year. We recommend walking into a crowded Halloween party and just creeping around all night, saying nothing! You're guaranteed to spook the heck out of people. 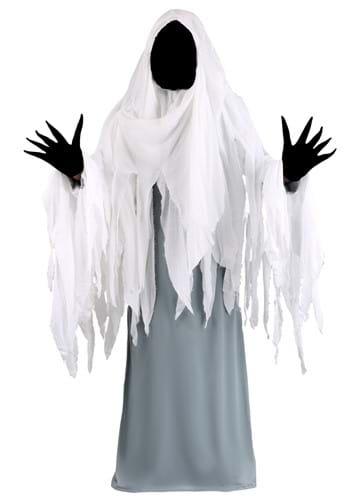 Make Halloween truly spooky again with this awesome Plus Spooky Ghost Costume, which is made by us. And for some added creep factor, be sure to have a look around at our scary accessories (like the Skull Light Up Lantern, pictured)! The hood has no structure, it lays smashed, flat on the top. It's very hot, there is no ventilation, that combined with the black cloth covering your face it's makes it hard to breathe and it became very claustrophobic. Also you can't see out through the black cloth, at night it was impossible to see anything. The hole where the face is has no support, it does not look perfectly round like the photo, it clasped in around your face. So I'm going to sew in some support around the face and vent holes and structure to the hood, but if your not the crafty type I would pass. The robe is a mess and almost impossible to put on by oneself. The stitching attaching the white cloth to the gray base is often in awkward positions making the costume less comfortable.